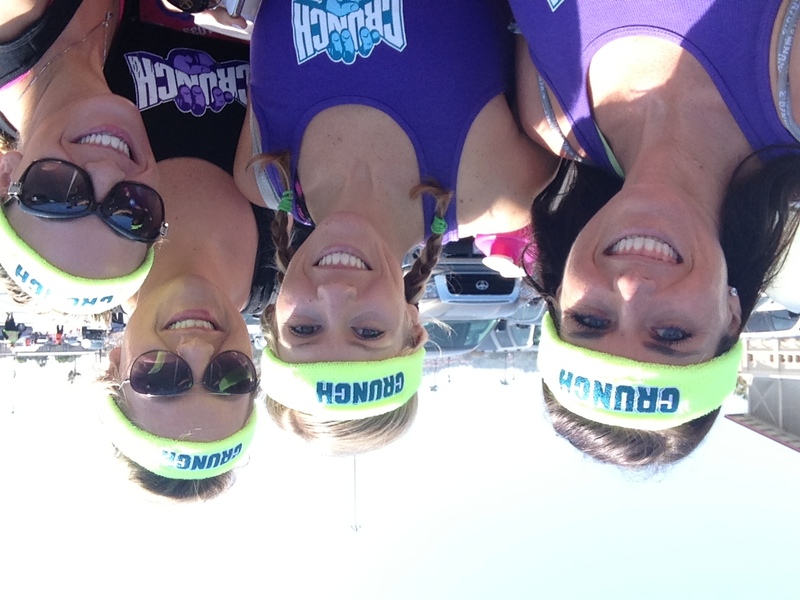 On Saturday a team of my co-workers and I completed the Ridiculous Obstacle Challenge,a 5k course filled with crazy, game-show style obstacles held at the Del Mar Fairgrounds. I organized the event as a company team building activity and was really happy with the turnout and the course (we only have about 25 employees in our office so 9 was pretty good!). 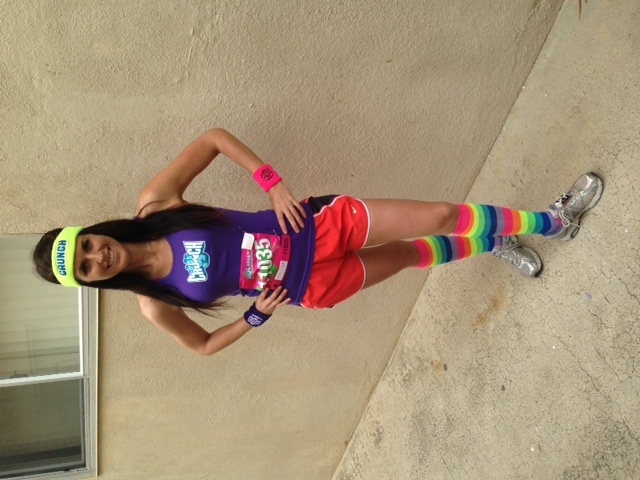 We decided to wear bright and/or neon colors and some of us got matching crazy socks for the event. Our wave was supposed to go off at noon but they were still sending off the 11 a.m. waves. They were breaking the groups up into 10 minute segments to avoid pile ups at the obstacles. I definitely think this was a great idea, although it didn’t completely stop lines from forming. As soon as we started a group of five of us (four girls, one guy) broke off. The first obstacle was simple – just crawl through some tubes. The second obstacle was really cool – we climbed up onto some platforms via a rope and then bounced on trampolines between platforms (they advised two bounces, I found three worked for me). At the end, we took a fire pole down. 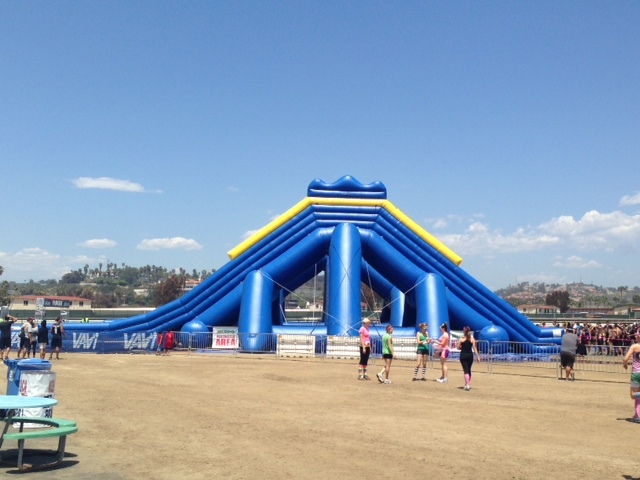 After running a bit more we hit more obstacles, including one of my favorites – a water slide! We grabbed big inflatable tubes and ran up a hill and then slid down a crazy slide into a pit of muddy water. We kept running and hit up more obstacles. Some were simple like just literally jumping over a wall, scaling short concrete dividers and a tire run. Some of the more difficult ones were the monkey bars (So slippery! Only Allison made it across without slipping off!) and the rope swing over a mud pit (was somewhat simple/easy but it was intimidating at first). 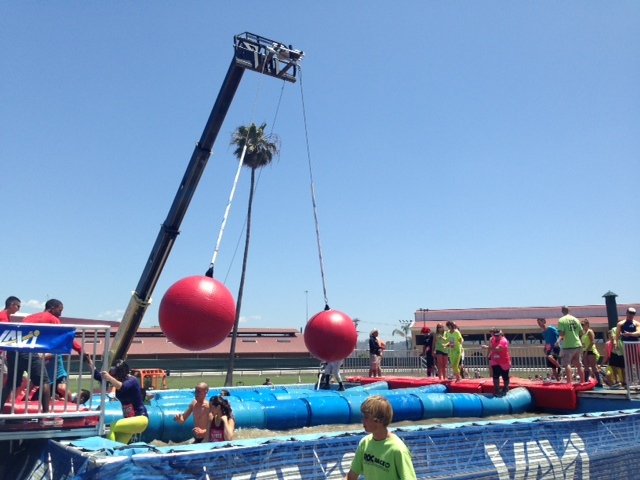 There was also an obstacle where you had to walk across a rope over a mud pit while holding on to a rope above. The tricky part was that a guy was there to try to shake you off! We saw a young boy in front of us get knocked off and he fell right over the bottom rope and was hanging over it for several seconds. After that happened, we told the guy NOT to shake us! Toward the end was some of the best obstacles. Unfortunately these had really long lines, up to twenty minutes each! The first one was “The World’s Largest Moon Bounce” and was basically a bounce house with low walls. Once they let us on, we all rushed onto it and then tried to jump up on the higher tier and all failed and bounced back. It was pretty hilarious watching us all attempt to bounce, crawl, and climb up onto the second level without assistance. Once we made it up we took advantage of the bounciness and hung out and bounced a bit – I felt like a kid again! The next big obstacle reminded me of Oh Sit! We waited in line quite a while then got up on a platform and had to run/walk over barrels over the water. The barrels rotated so you had to keep your balance perfect to make it across. On top of that, two huge red balls were spinning above and you had time to it to make sure they didn’t hit you during one of their rotations. I made a good attempt but still didn’t make it across! Only one in our entire group made it! 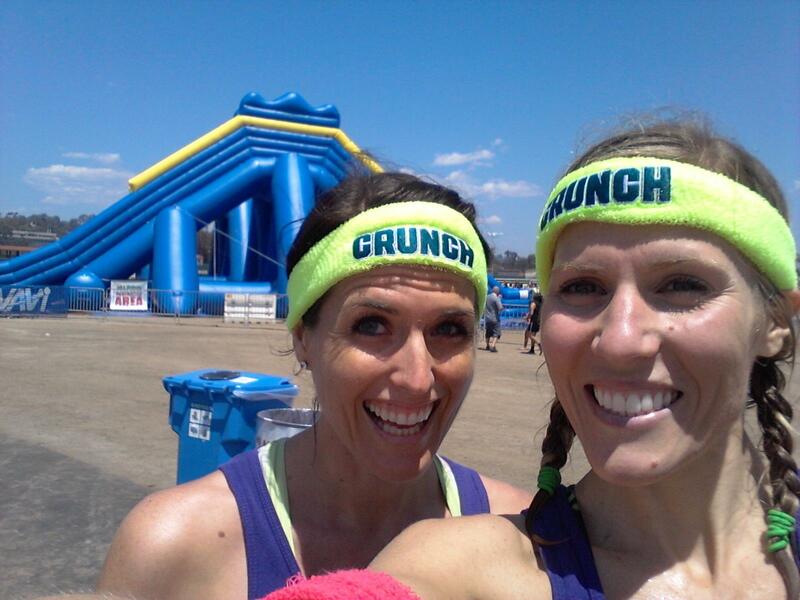 The last obstacle was awesome! It was a HUGE slide and contained the finish line. Once you go to the top, the guy scanned your chip to get your time and then you slid down. Honestly, I don’t know why they bothered with timing chips at this race because the lines were so long there is no way you could compete. It ended up taking us over 1.5 hours to make it through the obstacles and 3.1 mile course. Despite the lines, we still had a blast! We all decided we’d love to race again next year and hopefully our group will be even larger! Post race we enjoyed a beer and then headed home to relax. I was actually really tired from it all! I kept my effort low to moderate for the entire event since I’m only one week out from my last marathon, but just being out there for so long was tiring! And of course, I was sore the next day, mostly in my back and arms. A sure sign I need to get back to the weight room! 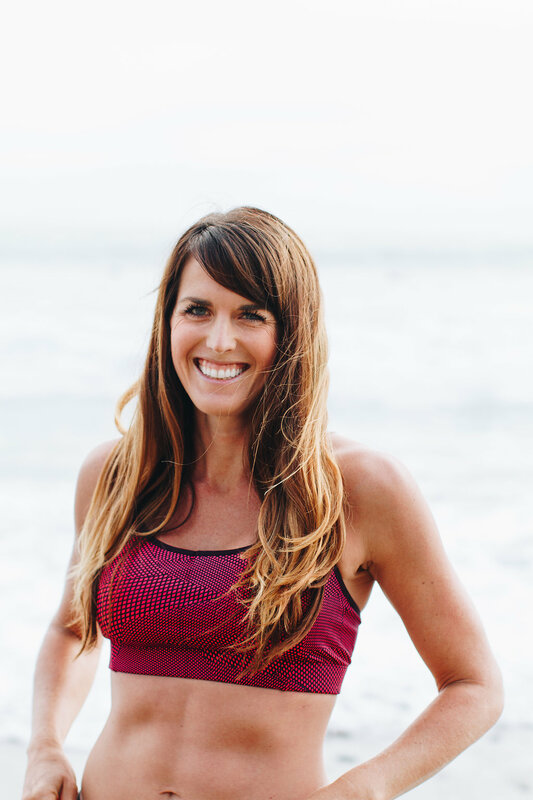 Allison and Me – We Made It! Have you ever done a race like this? Would you want to do it? What a great team building idea! 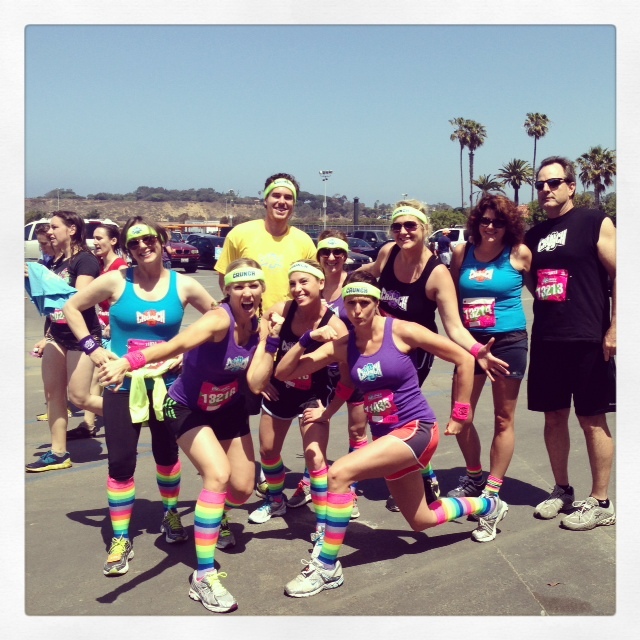 A few of my co-workers and I did the Dirty Girl 5K Mud Run/Obstacle course earlier this year, and it was a lot of fun. We had signed up for the first wave and thought we would regret it because it was so cold, but we lucked out and missed most of the crazy lines at the obstacles. We, friends and hubby, just signed up for this even in OC for July. I’m so glad I found your blog, as it gives me an idea of what I’ve gotten myself into.